One can hardly conceive of a plant more conducive to poetry than the aptly named "sensitive plant." The sensitive plant (Mimosa pudica), also known as the shy plant, shame plant and touch-me-not, has leaves that shrink away from the touch. It closes tight in the dark and opens to the light. 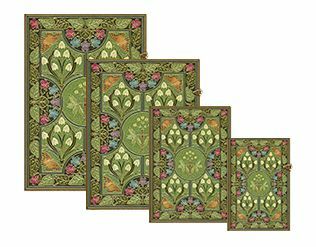 The design reproduced on our Poetry in Bloom covers was crafted by Riviere and Son and made with green morocco within fillets of gold leaf. The centrepiece is a sensitive plant surrounded by chambers containing snowdrops and other richly hued and contrasting flowers, foliage and butterflies. 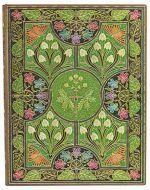 The original binding was used for The Sensitive Plant and Early Poems by Percy Bysshe Shelley, which employs the sensitive plant as an emblem for exploring how to find meaning and order in a world that leans toward entropy and chaos. Our covers are a celebration of the many moods of the creative spirit. We hope that our Poetry in Bloom journal users will be inspired by the contemporary style of binding we've chosen for this series. Paperblanks Poetry in Bloom Midi LINED. Paperblanks Flexis Poetry in Bloom Ultra 240pp SOFTCOVER LINED.